Tabetha Sullivan (center, in orange shirt) and Justice Burris (to Sullivan's left) are among seven William Chrisman High School students suspended Wednesday for 'defying' school administrators. 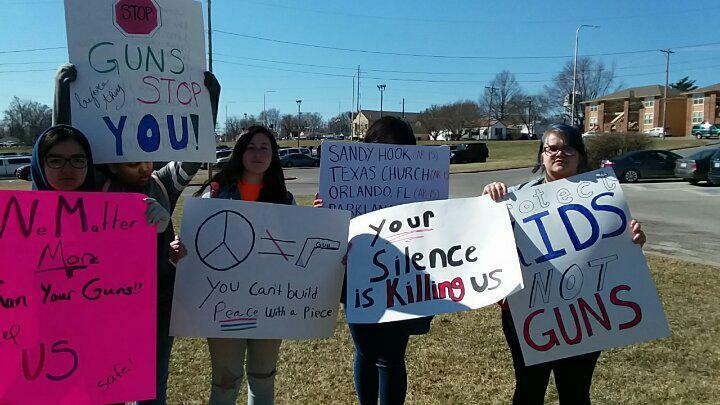 Students throughout the Kansas City metro enjoyed the support of school administrators and even the mayor when they walked out of schools at 10 a.m. Wednesday to protest gun violence and remember students killed at Marjorie Stoneman Douglas High School in Parkland, Florida. 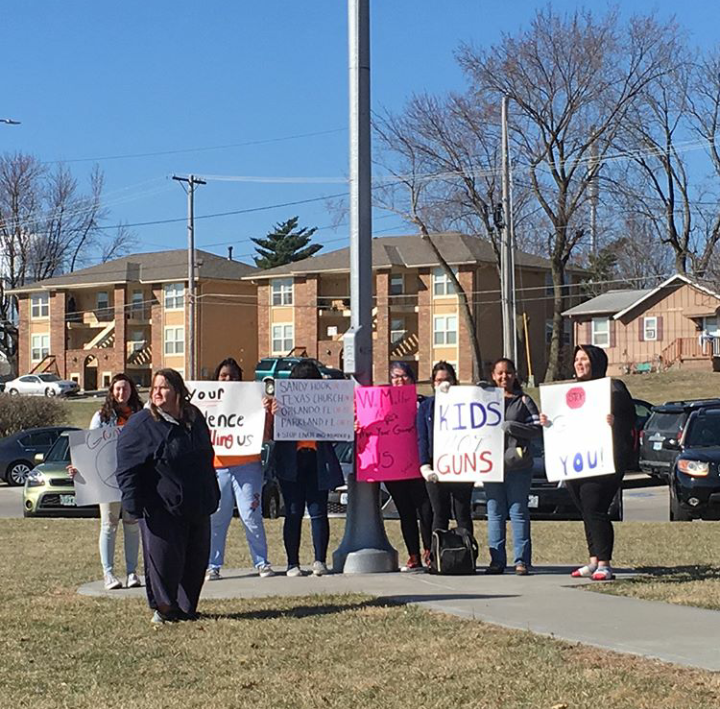 But the day went much differently for seven girls at William Chrisman High School, who earned five days of suspension after they decided not to adhere to the school-sanctioned walkout. "My group of friends had been planning to participate in the student-led walkout," says Chrisman freshman Tabetha Sullivan. "The week before the walkout, the administration and the Student Council got together and planned what they called a walkout, which was really just a memorial for the 17 who died at Parkland. We didn’t feel that it was actually student-led." The message had become too watered-down, Sullivan says, so they decided to go on with what they’d originally planned: to stand at flagpole for 17 minutes holding signs and posters. And when the 17 minutes ended and everyone else started walking from the football field back into the building, they stayed. "We decided we hadn’t been noticed enough — not only our effort to protest gun violence, but also what administration had done to what was supposed to be a student-organized and student-run walkout," Sullivan says. "We figured we were already in trouble for standing there, so we decided to stay for longer than 17 minutes," says Justice Burris, a freshman. "We thought maybe we were going to stay there all day." During the hour or so when they were at flagpole, Sullivan says, school buses began to pull into the driveway in front of the school, blocking anyone inside from seeing their protest. So they decided to walk to the top of the hill near Highway 24 and Noland Road and stand by the school sign. Eventually, some of the girls' parents, who'd been notified by school administrators, began showing up to take them home or go to the office to receive their punishments. Finally, the three remaining girls also headed to the office, where they met or waited for their parents. "When my mom asked the principal why, exactly, we were suspended for five days, the biggest reason was that we were being defiant," Burris says. "They told me we were truant for not being in class for half a day," Sullivan says. "Usually what you get for truancy is a writeup to the office, which is basically just a warning." "The other thing we were punished for was that we were being defiant, and that we had put ourselves in danger by standing next to street – the street we walk across every day to get to and from school," Sullivan says. "There was no paperwork to explain the five-day suspension," says Justice's mother, British Burris. British Burris says Becker kept asking whether anyone else besides the seven girls had been involved in their actions. "The meeting was a fishing expedition, so they could have a reason to justify the five-day suspension. They were trying to justify their reasoning by setting up a teacher, as if these seven girls couldn’t have set up the protest themselves," Burris says. "They did leave flagpole, they were being disobedient," she says. "But truancy does not hold a five-day suspension. They could have given these girls detention instead of expulsion." On Thursday, Burris says, Becker said the students would be allowed to do their homework and make up assignments while on suspension, which is not the norm for students who've been suspended. "Six of these kids are in honor classes, they’re not trouble children. You would think they’d broken out some windows, threw firecrackers, destroyed something, didn’t show up at school. All they did was stand up for something they believe in and they got suspended for five days," she says. "I think they’re taking these seven young ladies and using them as an example," Burris adds. "As we all know, there is going to be another walkout, so this was a message to other students: Rein it in or you can be suspended." Independence School District spokeswoman Jana Corrie says approximately 700 students in the district's three high schools took part in "student initiated" and "student-centered activities" on Wednesday. 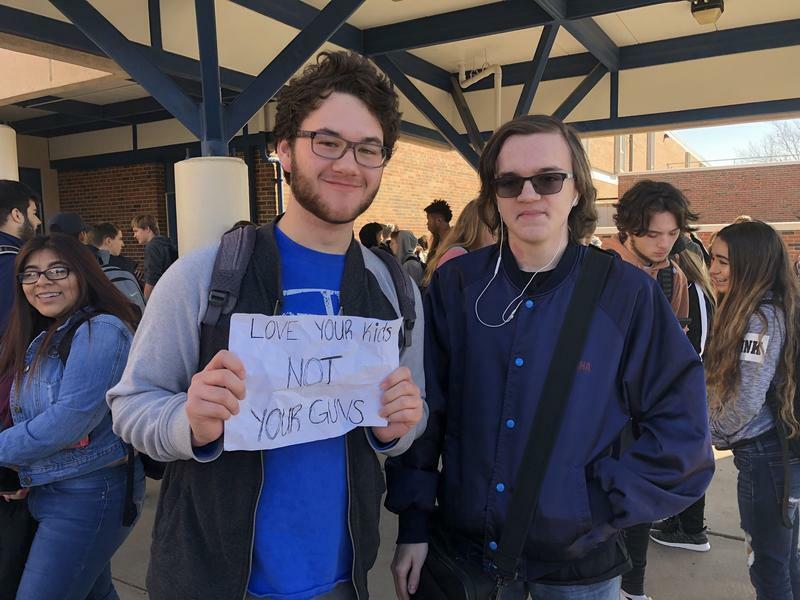 "The activities varied at each high school but all involved students holding a moment of silence for the Parkland victims. Some of the activities also included students chanting, walking around their track, holding and making signs, writing to politicians and sharing messages about kindness," she says. "We had more than 700 students who did not face discipline who took part in events Wednesday in a safe manner that was respectful of the school environment. Students who refused to return to school well beyond the allowed time, left school grounds without permission and who were dismissive and disrespectful to staff, would have been disciplined accordingly. I can assure you that students were supported in their freedom of expression." Also, Corrie says, "we are committed to student safety (and) cannot allow students to linger outside of our school building for hours during the school day without supervision." But it's the larger safety issue that motivated the girls who are now suspended. "This school is not safe for us and they’re not doing anything to change," says a third girl, whose name KCUR is not using because she is a minor and did not have her parent's permission to speak to the media. "All they’re doing is locking the doors and taking away our bathroom privileges." Along with their suspensions, the Chrisman students got a reinforced lesson about power structures. "The school," Justice Burris says, "really doesn’t like when you disagree with what they think."